What Day Of The Week Was September 8, 1994? 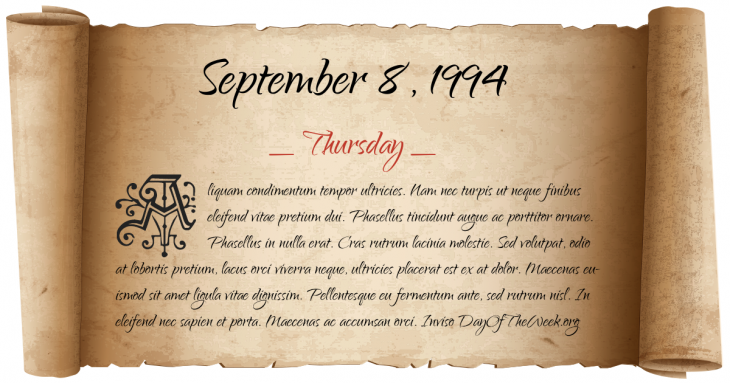 September 8, 1994 was the 251st day of the year 1994 in the Gregorian calendar. There were 114 days remaining until the end of the year. The day of the week was Thursday. A person born on this day will be 24 years old today. If that same person saved a Cent every day starting at age 5, then by now that person has accumulated $71.65 today. USAir Flight 427, on approach to Pittsburgh International Airport, suddenly crashes in clear weather killing all 132 aboard; resulting in the most extensive aviation investigation in world history and altering manufacturing practices in the industry.